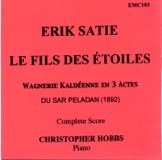 CD recording by Christopher Hobbs of Satie’s longest piece. Liner notes by the esteemed Satie scholar Robert Orledge. In 1989 Chris did the first performance of this piece in its entirety (the three Preludes which begin each act are well known and often played) for London Hall recordings. Since then, Chris has made a critical edition of this work (available as PN0031 here at the EMC) and it is this edition which informs the performance on the CD. Have you ever wished that Satie’s music would go on forever? Well, this one does, for a little longer than an hour of statuesque beauty. £10 + p & p. The score is on sale for £12.50 and the CD for £10 but if you order both together we will give you a £2.50 discount. For more details contact us at questions**experimentalmusic.co.uk (for **, substitute @ ).